Teachings of Lord Chaitanya is an introduction to the most advanced and esoteric subjects contained within Krishna conscious philosophy, as presented by Chaitanya Mahaprabhu. The text is a summary of the multi-volume biography Chaitanya Charitamrita, which contains some of the most elaborate, technical, and ecstatic revelations of the science of God found in any scripture. Mahaprabhu—Krishna Himself in the guise of His own ardent devotee—instructed His leading followers, such as the Six Goswamis, to write books on the science of God realization. In Teachings of Lord Chaitanya He systematically explains how each of us naturally has a unique relationship of loving service to the Supreme Person which can be awakened through the practice of bhakti-yoga, Krishna consciousness, essentially by chanting Krishna's names. The author, Srila Prabhupada, wrote Teachings of Lord Chaitanya many years before completing the full-length Chaitanya Charitamrita or even the Srimad-Bhagavatam. As a representative in the line of disciplic succession coming down from Chaitanya Mahaprabhu Himself, He competently explains the great significance of Mahaprabhu's teachings; they give the world unprecedented access to the highest states of pure love of God. Narrated by Amal Bhakta Dasa. Approximately 18 hours and 5 minutes. Five hundred years ago, Chaitanya Mahaprabhu gave the gift of love of God to everyone He met. Now is your chance to receive this gift. Lord Chaitanya spearheaded a spiritual renaissance in sixteenth-century India that had as its foundation the chanting of the Hare Krishna mantra. Five hundred years before Gandhi, this remarkable personality inaugurated a massive nonviolent civil-disobedience movement. He introduced a revolutionary spiritual movement based on the world's oldest and most comprehensive religious scriptures, the Vedas. This movement, He taught, would have universal appeal because it was based on the Absolute Truth, which transcends sectarian notions of race or creed. Teachings of Lord Chaitanya, which is a summary study of Sri Chaitanya-charitamrita, documents Chaitanya's conversations with the great scholars, kings, saints and mystics of His day. Chapter 23: Why Study the Vedanta-Sutra? There is no difference between the teachings of Lord Chaitanya presented here and the teachings of Lord Krishna in the Bhagavad-gita. The teachings of Lord Chaitanya are practical demonstrations of Lord Krishna's teachings. Lord Krishna's ultimate instruction in Bhagavad-gita is that everyone should surrender unto Him, Lord Krishna. Krishna promises to take immediate charge of such a surrendered soul. The Lord, the Supreme Personality of Godhead, is already in charge of the maintenance of this creation by virtue of His plenary expansion, Kshirodakashayi Vishnu, but this maintenance is not direct. However, when the Lord says that He takes charge of His pure devotee, He actually takes direct charge. A pure devotee is a soul who is forever surrendered to the Lord, just as a child is surrendered to his parents or an animal to its master. In the surrendering process, one should: (1) accept things favorable for discharging devotional service, (2) reject things unfavorable, (3) believe firmly in the Lord's protection, (4) feel exclusively dependent on the mercy of the Lord, (5) have no interest separate from the interest of the Lord, and (6) always feel oneself meek and humble. However, the scholarly demons misguide the masses of people by directing them to the impersonal, unmanifest, eternal, unborn truth rather than the Personality of Godhead. The impersonalist Mayavadi philosophers do not accept that the ultimate aspect of the Absolute Truth is the Supreme Personality of Godhead. If one desires to understand the sun as it is, one must first face the sunshine, then the sun globe and, after entering into that globe, come face to face with the predominating deity of the sun. Due to a poor fund of knowledge, the Mayavadi philosophers cannot go beyond the Brahman effulgence, which may be compared to the sunshine. The Upanishads confirm that one has to penetrate the dazzling effulgence of Brahman before one can see the real face of the Personality of Godhead. Lord Chaitanya therefore teaches direct worship of Lord Krishna, who appeared as the foster child of the King of Vraja. He also suggests that the place known as Vrindavana is as good as Lord Krishna because there is no difference between the name, quality, form, pastimes, entourage and paraphernalia of Lord Krishna and Lord Krishna Himself. That is the absolute nature of the Absolute Truth. Lord Chaitanya also recommended that the highest mode of worship in the highest perfectional stage is the method practiced by the damsels of Vraja. These damsels (gopis, or cowherd girls) simply loved Krishna without a motive for material or spiritual gain. Chaitanya also recommended Srimad-Bhagavatam as the spotless narration of transcendental knowledge, and He pointed out that the highest goal in human life is to develop unalloyed love for Krishna, the Supreme Personality of Godhead. Although Lord Chaitanya was widely renowned as a scholar in His youth, He left only eight verses, called Sikshashtaka. 1. Glory to the Sri Krishna sankirtana, which cleanses the heart of all the dust accumulated for years and extinguishes the fire of conditional life, of repeated birth and death. This sankirtana movement is the prime benediction for humanity at large because it spreads the rays of the benediction moon. It is the life of all transcendental knowledge. It increases the ocean of transcendental bliss, and it enables us to fully taste the nectar for which we are always anxious. 2. O my Lord, Your holy name alone can render all benedictions to living beings, and thus You have hundreds and millions of names like Krishna and Govinda. In these transcendental names You have invested all Your transcendental energies. There are not even hard and fast rules for chanting these names. O my Lord, out of kindness You enable us to easily approach You by Your holy names, but I am so unfortunate that I have no attraction for them. 3. One should chant the holy name of the Lord in a humble state of mind, thinking oneself lower than the straw in the street; one should be more tolerant than a tree, devoid of all sense of false prestige and should be ready to offer all respect to others. In such a state of mind one can chant the holy name of the Lord constantly. 4. O almighty Lord, I have no desire to accumulate wealth, nor do I desire beautiful women, nor do I want any number of followers. I only want Your causeless devotional service birth after birth. 5. O son of Maharaja Nanda [Krishna], I am Your eternal servitor, yet somehow or other I have fallen into the ocean of birth and death. Please pick me up from this ocean of death and place me as one of the atoms at Your lotus feet. 7.O Govinda! Feeling Your separation, I am considering a moment to be like twelve years or more. Tears are flowing from my eyes like torrents of rain, and I am feeling all vacant in the world in Your absence. 8. I know no one but Krishna as my Lord, and He shall remain so even if He handles me roughly by His embrace or makes me brokenhearted by not being present before me. He is completely free to do anything and everything, for He is always my worshipful Lord unconditionally. Throughout the ages, many avataras—divinely inspired teachers and incarnations of God—have appeared in the world, but none has ever distributed spiritual love as freely as the golden avatar, Lord Chaitanya Mahaprabhu. Chaitanya Mahaprabhu (Mahaprabhu means "the great master") appeared in Bengal, India, in 1486, and he lived for only 48 years, yet He began a revolution in spiritual consciousness that has profoundly affected the lives of millions. Renowned as a great saint even in his youth, Lord Chaitanya left His family and friends at the age of 24 to teach the forgotten essence of ancient Vedic wisdom throughout India. Although he himself was a fully renounced mystic, He taught how one can act in spiritual consciousness even with ones home, occupation, and social affairs. Thus, His teachings, although timeless, bear special relevance for today's world. This book tells about the extra ordinary life of this great saint and explains the essence of His teachings. A Note About this Edition [from book, page 356]: "Srila Prabhupada completed Teachings of Lord Chaitanya in 1967, and his Bhaktivedanta Book Trust (then known as ISKCON Press) published it in 1968. 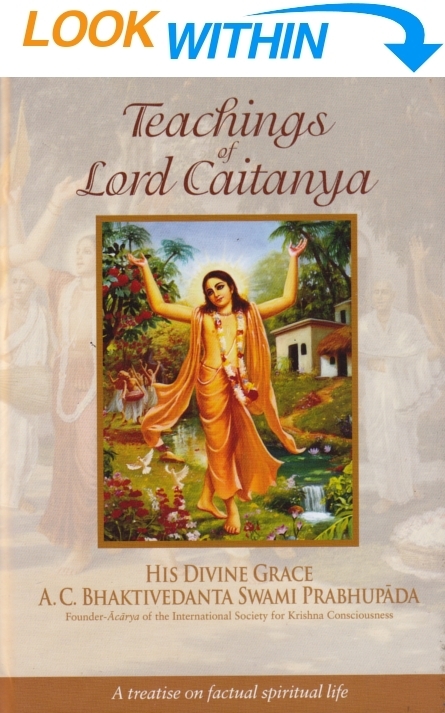 In 1974 the BBT published an extensively revised edition with Sanskrit diacritical marks and selected verses from Sri Chaitanya-caritamrta, the source book for Teachings of Lord Chaitanya. "For the present edition, the editors compared the two previous editions (the original manuscript is lost) and restored some of the flavor of the original. In addition, they found that, perhaps owing to Srila Prabhupada’s heavily accented English, the uneven quality of his dictated tapes, or the difficult philosophical concepts in some passages of Teachings of Lord Chaitanya, the original transcribers and editors had occasionally erred. These errors, constituting less than three percent of the total text, have now been corrected, so that an already perfect book has become even more perfect for its increased fidelity to Srila Prabhupada’s original words and intended meaning."